Cosmetics makers should be required to submit reports of suspected harm from their products to the FDA, researchers who recently analyzed an FDA database and a former commissioner say. Manufacturers are many times more likely to be alerted to possible health-related problems and reactions than the federal agency, the researchers said. Bloomberg BNA’s own analysis of selected cosmetics-related adverse event reports in the Food and Drug Administration database bears out their argument that the makers get far and away the vast majority of reports of suspected injuries, even potentially fatal ones. That information may come from complaints by consumers to the company directly, or from court filings of consumers seeking redress in the U.S. judicial system. Our analysis of adverse events related to ovarian cancer—the most high-profile and serious potential injury currently linked to a cosmetic product—also points to another limitation of the current voluntary reporting system: When a maker does report to the FDA, little information in those reports is made public. “One can only assume that whatever products are reported on, you need to multiply that out by a large number to understand what the manufacturers are probably getting,” Dr. Steve Xu, a dermatologist and lecturer at the Northwestern University Feinberg School of Medicine, Chicago told Bloomberg BNA after his review of 13 years worth of summaries of cosmetics-related adverse event reports filed in the database. Dr. Robert M. Califf, who served as FDA commissioner under President Barack Obama, agreed with Xu that mandatory manufacturer reporting is needed. Reporting is one of the few tools the underfunded FDA Office of Cosmetics and Colors has to gauge the safety of cosmetics, he said. Voluntary manufacturer reporting, coupled with chronic consumer under-reporting to the FDA, means that potential safety problems aren’t flagged, Califf said. Cosmetics companies don’t need premarket approval for selling their products, and don’t have to register their products or ingredients. Nor can FDA recall cosmetic products. “Without a legal requirement for the cosmetics industry to collect or report adverse events or even register marketed products, the FDA must wait for clues to accumulate from voluntary reports suggesting that a product may not be as completely safe as presumed,” Califf said in an editorial accompanying Xu’s study. Xu’s study and Califf’s editorial were published in JAMA Internal Medicine. Johnson & Johnson said in an August 3 securities filing that it is defending itself from about 4,800 plaintiffs who allege its talc products, mainly Johnson’s Baby Powder, caused women to develop ovarian cancer.The company has been hit with more than $600 million in jury awards over the last two years in that litigation, making it easily the biggest-ticket, most publicized cosmetic-linked injury litigation currently underway. For that reason, Bloomberg BNA examined the number of ovarian cancer reports linked to J&J in the FDA’s database, which goes back to January 2004. Bloomberg BNA's analysis of the summary reports filed thru June 2017 revealed only 131 reports specifically associated with the company’s talc products. 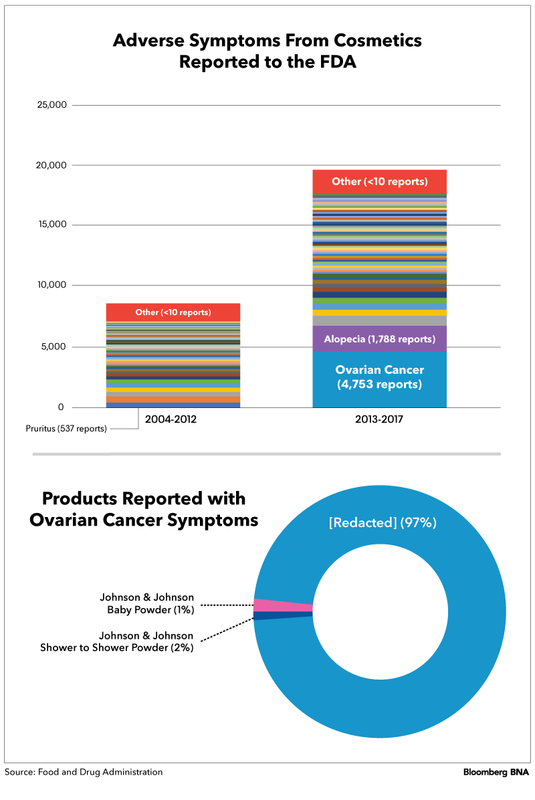 Talc reports were few, but many more ovarian cancer reports were plenty: 4,622 in total. When combined with the 131 reports specifically naming J&J, it’s roughly the same number of plaintiffs the company is currently facing in court. In fact, the ovarian cancer figure is so large it amounts to 41 percent of all cosmetics-related reports in the database from January 2013 to June 2017. But, other than showing their scale, these 4,622 ovarian cancer reports in the database offer only very limited details related to the suspected causes of those consumers’ reported health problems..
That’s because key information pertaining to all of these summary reports of ovarian cancer is redacted, consistent with FDA disclosure regulations. Under those rules, when a manufacturer voluntarily submits an adverse event report to the agency, significant information—including the manufacturer’s name, the product name, and even the type of cosmetic product involved—are not included in the summary of the report posted in the database. The rest of the report summaries are redacted, Bloomberg BNA’s analysis found. The maker and product name are revealed in those 131 reports because they were submitted by consumers or doctors directly to the FDA. In such cases, identifying information about the product’s user, but not the name of the product or its maker, is removed. An FDA spokesperson told Bloomberg BNA it couldn’t disclose the identity of the manufacturer or manufacturers that submitted the ovarian cancer reports. The agency confirmed, however, that it received about 4,400 adverse event reports between January 2014 and March 2017 on ovarian cancer, and that those reports were associated with the use of body powders. Johnson & Johnson, which denies a cancer connection to its products and is appealing the verdicts against it, wouldn’t say whether it submitted the ovarian cancer adverse event reports to the FDA. Despite those assurances from J&J, the large number of ovarian cancer reports, and the relatively small number naming J&J or its talc products, illustrate a problem and a pattern: Cosmetics makers get much more information about potential health problems than regulators. They also have the power to decide how much, if any, of that data to pass on to the FDA. And when manufacturers do report suspected health problems to the FDA, only very limited information about those reports are made available to the public. Though not involving nearly the same degree of alleged harm as the cancer that consumers have linked to talc, reports of injury tied to Wen hair products made by Chaz Dean Inc. are also illustrative. Some 127 people initially reported reactions such as hair loss and scalp irritation from the products to the FDA between February 2011 and July 2016, the agency said on its website. But during inspections of manufacturing and distribution facilities, the FDA learned of 21,000 more consumer complaints lodged directly with Chaz Dean and distributor Guthy-Renker LLC, the agency said. Only a small fraction of those reports currently show up in the database, according to Bloomberg BNA’s analysis. Similar to Johnson & Johnson’s talc products—though again, on a much smaller scale—private litigation also ensued over the Wen by Chaz Dean products. It resulted in a $26 million settlement, which the U.S. District Court for the Central District of California approved Aug. 21. The disparity between the amount of safety-related information that makers and the FDA receive is of particular concern to some consumer health advocates because the FDA has so few regulatory options for cosmetics. “There is really so little power that FDA has, and I think these lawsuits coming up really show why this is such a significant problem,” Melanie Benesh, legislative attorney with the Washington-based Environmental Working Group, an advocacy organization that works to protect health and the environment, told Bloomberg BNA. As for Xu, the Northwestern University researcher, he and two of his colleagues looked at all cosmetics-related reports filed by consumers or doctors that were available when the database first became public in December 2016. That included adverse events from January 2004, the oldest data publicly available, to September 2016, which was then the latest data of this type available. The researchers’ study didn’t include include a count of the industry-supplied ovarian cancer reports. Those reports, according to the FDA, weren’t added to the database until 2017. Their overall conclusions? For the 13-year period the researchers studied, there were approximately 75,000 total adverse event reports in the database, which also covers food and dietary supplements. Of that total, only 5,144 reports—just a few hundred more than the ovarian cancer reports from industry—were cosmetics-related. Skin and hair products represented more than half of the cosmetic reports in the database during the time period the researchers studied, Xu said. Wen hair products were the most frequently reported specific product or brand then in the database. The researchers counted 1,211 reports, he told Bloomberg BNA. There were so few Johnson and Johnson reports during that time period, that J&J didn’t even make Xu’s top five list of most recurring names. Premier Pigments products, mostly tattoo inks, were listed second-most, with 137 reports naming that company. Brazilian Blowout (97), L’Oreal (89), and EOS (87) rounded out the five names found most often in the database, Xu said. Despite the low overall reporting numbers, the researcher isn’t discouraged. “There is some data here; it’s not of high value yet but it could be,” he said. “There has to be broader awareness of this database. Both providers and patients should participate more, and there has to be a legislative mandate for manufacturers to forward reports to the FDA,” Xu said. “In the next five to 10 years, hopefully the database can be more useful for epidemiologists and public safety purposes,” Xu said. The FDA advised when it made its database public in 2016 that the database has limitations. The information appears as it was reported to the agency, doesn’t represent agency conclusions, and doesn’t reflect certainty about whether the product caused the symptoms, the FDA said on its website. But, though the reports are just raw data as submitted to the FDA, “they are important because” they’re “one of the few tools FDA has to monitor possible safety problems with cosmetics,” Linda Katz, director of the FDA’s Office of Cosmetics and Colors, said in a statement issued at the time. Meanwhile, the FDA says it’s revisiting cosmetic talc, in part because of the continuing influx of adverse event reports. The agency denied a citizen petition in 2014 seeking a label on talcum powder warning of a possible link to ovarian cancer. “We did not find such a link in our review of the scientific literature at the time,” Katz said in her same 2016 statement. The FDA’s Office of Women’s Health in 2016 funded a talc-related research project that is slated to be finished over the next few years. “Once the project is completed we will make the results available either through a scientific publication or our website,” the agency said. The project is fully funded, FDA told Bloomberg BNA. Industry agrees that more regulation is needed. “Despite the very strong safety record of cosmetic products, the Council and its member companies believe more can be done to ensure that FDA has the appropriate authority and resources to regulate our products in the 21st century,” Lezlee Westine, president and CEO of the Personal Care Products Council, said in a statement responding to the JAMA study and editorial. The council has advocated for required reporting by manufacturers to the FDA of serious and unexpected adverse health events, she said. The council’s members include Johnson & Johnson and more than 600 other companies that manufacture, distribute, and supply the vast majority of personal care products marketed in the U.S., the group’s website said.